I love the idea of Free and Easy Travelling. The timings are more flexible. We are not forced to go to places that we dont want to go. I love the idea of getting lost and end up in somewhere exciting. Get to know where the locals go, do and eat. and of course, we can choose ourselves on the places that we want to stay in. I always love the idea of staying in a Hotel. it always give a feeling of travelling. More over with Hotel Facilities like wi-fi, breakfast, shuttle bus, security, cleanliness, swimming pool, etc. But sometimes the Hotel price is too sky-rocket and could not match with your budget. Or Maybe sometimes you just want to experience the local-stay in the foreign country that you are going. Or Maybe it’s a group of 4, and you cannot find suitable hotel that can fit 4-5 of you in the same room. Well, it’s kinda because of that 3 reasons, i booked my first AirBnb service when i went to Japan last year. AirBnb is Air Bed and Breakfast, where they offer you a place to stay and give you a simple breakfast like bread and jam (not all). This company founded on 2008 by a Harvard graduate and eventually made a firm stand and start to be famous on 2010-2011. I guess now, most of us already know what AirBnb is. Was very curious that time and immediately google on how this AirBnb work. When i looked on their website, i was so fascinated, and thought that i will try to stay in AirBnb when i have the chance. The website is so each to navigate, and it is a very good website. They are very detailed. Like from the owner’s biography, nice pictures and lists of amenities and nearby attractions around them. They also have availability calendar, and direct contact to the owners. so i can say that it’s quite hassle free in making the booking. At first one of my friend asked if it’s safe to stay in other people’s house, because we barely know the language and it was our first time there. He afraid If something happen, it will be very difficult since there’s no security and all. But after i explained that AirBnb is save (in most of the review), and it’s worth the try. Finally everyone was up to try it and decided to book 1 room apartment in Shibuya last year during our trip to Tokyo, Japan. and this how it looks like. It’s a very small studio room. When you go in to the room, there’s a small space where you can put your shoes in the shoe rack, and a space to store your umbrellas. and when you come further, its the small kitchen where you can cook. All amenities are hanging and inside the cupboards. 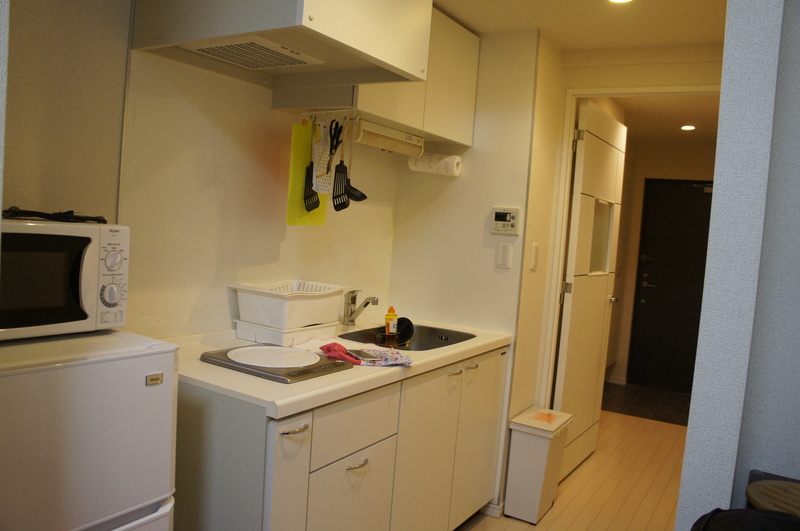 on the Right hand side of the the pictures, is the bathroom and a washing machine. too bad, i forgot to take a picture on that corner. And finally, it’s the Beds already.. haha. They have microwave and fridge. On the Left side of the second pictures, they have a rack where they put iron, toaster, water-heater, and hair-dryer. It’s small room, yet it was very comfortable for 4 of us to stay in. They provide us TV and portable wi-fi, as well as towels, shampoo and soaps. The pictures that they put in AirBnb is exactly the same.. so we are quite amazed as well. and the most amazing thing is how they managed to put all the things inside such a small room, and yet so hommie..
To book your stay in AirBnb is so convenient, you just need to create a profile. a fun profile! Then search for a place that you like, and book your stay! so easy and convenient. haha. This is not a paid post.. this is personal review of satisfied customer. Actually there’s another website if you are really on Budget, which i guess most of you already know it as well. it is called Couchsurfing . I came to know this website from my friend’s cousin. He came to Singapore about 5 years ago for holiday. i asked him where did he stay? He answered, ‘oh, i couchsurf’. and i was like, ‘What is that? is that a name of a place?’ haha. Then he explained again that it’s a website whereby you can stay for free in anyone’s house (read:couch) from all over the world, BUT in return, you need to let them stay for free on your couch as well when they are visiting your country. It’s like an open-house concept, but you cannot stay with your friends because they only have limited space in the house. The pros is you get to stay for free. but the cons is you need to wait the owner to be back at home if you want to enter the house. So, you wont get any key, and you should be out when the owner is out, and you can only go in again when their home. Which is, pretty much logical i guess for a free stay.. Just that you cannot go back to get some rest if you want to. This entry was posted in Asia, Review, Uncategorized and tagged airbnb, budget, couchsurfing, jendstravel. Bookmark the permalink. whee.. italy! im going there next month.. tapi pergi sama tour. =(. u have any review for your pleasant stay? mau liat dong kalo ada.. hehe.. Cool! Have fun! Don’t really review accomodations. Priority is always to see other’s review on how clean it is. I have read some unpleasant stories about Couchsurfing though. I am not saying it is dangerous but one needs to be careful 🙂 . I have tried AirBnB once when I was in India. It was okay. We were not fully satisfied with what we got but it was not because of the AirBnB, it was because of the apartment itself, haha 😆 . oh yaa.. what kind of unpleasant stories? aku ga pernah dnger sih. soalnya jarang juag di social circle aku yg pake courchsurf gara2 pada takut. hoho.. serius?? haha.. ok. review yah nanti gimana si couchsurf.. hehe. mudah2an ownernya baik..
oh ya? baru tau lohh.. di kirain family friendly gt.. hoho.. I have been using Air BnB (from rooms, apartments to houses) for 5 years now, it is good. No problem at all.